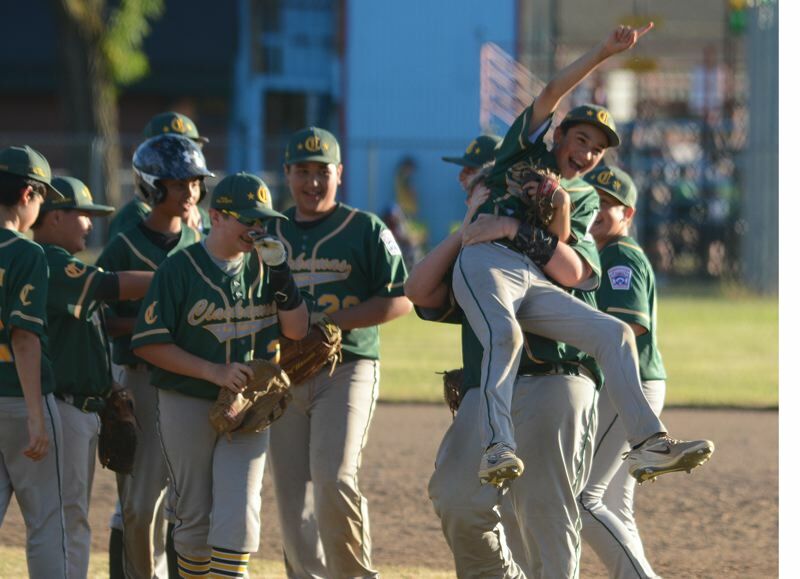 GRESHAM — Clackamas Little Leaguer Ethan Carrillo settled under an infield pop-up and let out a scream as the ball dropped into his glove to finish the team's 5-0 win over East Lane for the 14U state championship Tuesday night. Carrillo raced toward the pitcher's mound looking for a teammate to embrace when Jordan Kunz swept him off his feet and lifted him high into the air, while his buddy raised a No. 1 finger above his head. With the win, the Clackamas all-stars punched their ticket to the West Regionals in Nogales, Ariz., where Clackamas will take on the host team in the opening game at 6 p.m. Wednesday, July 18. "It's going to be a fantastic experience for the kids," Clackamas coach Mick Carrillo said. "We play in the first game, so it's a quick turn around and we will have to acclimate quickly, but I expect the kids will have a blast." Clackamas took early command of Tuesday's finale when a series of singles brought home Jack Nguyen, Jack Holt and Dane Gillies for a 3-0 lead in the second inning. That was more than enough for starting pitcher Jackson Bernstein-Sheehan, who went the distance, scattering seven hits and striking out five batters for the shutout. Clackamas dropped a tight 5-3 decision to East Lane in the day's early game, but because Clackamas was the winner's bracket team it got a second chance at the state title. "We were trying to do too much in that first game, we played a lot looser in the second game," Mick Carrillo said. "We realized that we came out of the winner's bracket, so we had the advantage pitching-wise. Jackson did a great job, and we still had plenty of other guys who could throw, so that boosted our confidence." Other members of the championship team are Malachi Ahmed, Tucker Buchanan, Elliot Carrillo, Jack Nguyen, Sage Pullar, Leo Renzema, Alex Stephen and Kayden Wenzinger, along with coaches Chris Stephen and Kevin Gillies. Find expanded coverage ahead in our Wednesday, July 18, print edition.